1895 - First U.S. Open (won by Horace Rawlins) played at Newport (RI) Golf Club. 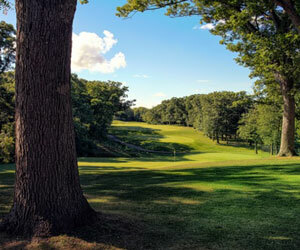 1899 - Inaugural Western Open (won by Willie Smith) played at Glenview (IL) Golf Club. 1900 - Harry Vardon tour of United States generates widespread interest in game. 1913 - Francis Ouimet captures U.S. Open playoff with Vardon and Ted Ray. 1914 - Walter Hagen wins first of 11 major titles in U.S. Open at Midlothian Country Club outside Chicago. 1916 - PGA of America formed; JimBarnes wins first PGA Championship over Jock Hutchison at Siwanoy CC in Bronxville, NY. 1922 - Gene Sarazen (age 20) wins U.S. Open (Skokie Country Club in Glencoe, IL); also wins PGA Championship (Oakmont CC), becoming first to hold both titles at once. 1926 - Los Angeles Open offers $10,000 purse. 1930 - Bob Harlow named manager of PGA Tournament Bureau and broaches idea of year-round tournament circuit; raises annual purse money on the Tour from $77,000 to $130,000 in first year on job; instrumental in creating volunteer system by which TOUR functions to this day; Code of Conduct drawn up. 1931 - Golf Ball and Golf Club Manufacturers Association puts up $5,000 to support sponsors during 1931-32 winter swing. 1932 - "Playing Pros" organization formed, pre-dating by 36 years formation of current PGA TOUR organization. 1933 - Hershey Chocolate Company, at least unofficially, first corporate sponsor on PGA TOUR with Hershey Open. 1934 - Group of players meets to discuss possibilities of year-round tournament circuit; Horton Smith wins first Masters at Augusta National Golf Club; leading money winner for year Paul Runyan earns $6,767. 1937 - First Bing Crosby Pro-Am/"Clambake" played at San Diego's Rancho Santa Fe CC; Sam Snead becomes nationally recognized figure in golf by winning Oakland Open. 1938 - Palm Beach Invitational makes first TOUR contribution to charity, $10,000. 1945 - Byron Nelson captures 11 consecutive tournament starts, seven other official events and one unofficial, a total of 19 wins in one year; voted 1945 Associated Press Male Athlete of Year; Tam O'Shanter All-American offers $60,000 purse. 1947 - U.S. Open televised live in St. Louis area. 1949 - Ben Hogan critically injured in head-on collision of his automobile with Greyhound bus. 1950 - Ben Hogan returns to competitive golf in Los Angeles Open, starting with two-under-par 34 on his front nine and eventual 280 total tied by Sam Snead; loses playoff eight days later. 1953 - Ben Hogan wins three major championships: the Masters, U.S. Open and the only British Open he ever played Lew Worsham wins first PGA TOUR event to appear live on national television, Tam O'Shanter World Championship Golf's "color barrier" broken with PGA constitutional amendment allowing for "Approved Entries," non-members who could play in tournaments if invited by sponsors. 1955 - World Championship of Golf offers first $100,000 purse in PGA TOUR history. 1956 - Masters Tournament televised for the first time. 1957 - "All-Star Golf," first series of matches between pros filmed for television, has its debut. 1961 - Caucasians-only clause stricken from PGA constitution; PGA TOUR officially integrated. 1962 - "Shell's Wonderful World of Golf" begins nine-year run. 1965 - Inaugural Qualifying School held at PGA National Golf Club in Palm Beach Gardens, FL; John Schlee first medalist. 1968 - Association of Professional Golfers (APG), an autonomous tournament players' organization, forms in breakaway. from PGA. As compromise, Tournament Players Division of PGA formed under aegis of 10-man policy board late in year. 1969 - Joe Dey becomes first Commissioner of Tournament Players Division. 1974 - Deane Beman succeeds Dey as Commissioner on March 1 Jack Nicklaus captures inaugural Tournament Players Championship (now THE PLAYERS Championship) at Atlanta CC. 1977 - Al Geiberger records first sub-60 round in PGA TOUR history on June 10, a 59 in Danny Thomas Memphis Classic at Colonial CC. 1978 - First "Legends of Golf" played at Onion Creek CC in Austin, TX, precursor of Senior PGA TOUR. 1979 - PGA TOUR Headquarters relocated from Washington, D.C. to Ponte Vedra Beach, FL. 1980 - Senior PGA TOUR organized with four tournaments First Tournament Players Club opens, the TPC at Sawgrass in Ponte Vedra, FL. 1983 - All-Exempt TOUR put in place, virtually eliminating Monday qualifying; top 125 players exempt; Tournament Players Series (TPS) begins three-year run; PGA TOUR Pension Program begins. 1985 - PGA TOUR Productions created. 1986 - Panasonic Las Vegas Invitational offers first $1 million purse in PGA TOUR history. 1987 - PGA TOUR surpasses $100 million in charitable contributions. 1988 - 30 players compete at Pebble Beach for $2 million in Nabisco Championships, predecessor of THE TOUR Championship. 1990 - Ben Hogan Tour comes into existence as developmental circuit, succeeded by NIKE TOUR beginning in 1993. 1991 - Chip Beek matches Geiberger's 1977 feat on October 11, carding a 59 at Sunrise Golf Club during Las Vegas Invitational. 1992 - PGA TOUR surpasses $200 million in charitable contributions. 1993 - The PGA TOUR boasts a record five $1 million winners. 1994 - Tim Finchem succeeds Beman as Commissioner on June 1 Inaugural Presidents Cup Match played; U.S. defeats Internationals 20-12. 1995 - PGA TOUR initiates staff reorganization to strengthen core business: competitions; first major international golf competition held in People's Republic of China, World Cup of Golf, played at TPC at Mission Hills. The "Champions Package" includes TWO days of golf featuring 18 holes on the world famous Course No. 4-Dubsdread and 18 holes on the sporty Course No. 2-Ravines. Experience two courses celebrated for crowning champions including the likes of Tiger Woods, Jim Furyk, Matt Kuchar, Nick Price, and most recently Justin Rose! This pairing is recognized as one of the "Ten Best Two-Course Combinations in the World" by Links Magazine.